I have 3 of these Phase Change Convertors doing a fantastic job within each application they are used.No 1. convertor runs our milling plant.No 2. convertor runs our computerized filling machinery.No 3. convertor runs our bore pump.Before we started using these 3 phase convertors within our factory we were using a huge generator at a big running cost, so using this has become a big cost saving for us within our factory.The convertor at the bore has allowed us to use a 3 phase bore pump which offers higher water flow then what the single phase pumps offered and 3 phase pumps are much more reliable then a single phase bore pump. 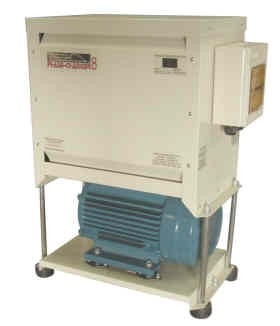 Whatever the application, the team at Phase Change Convertors can offer a suitable machine for all requirements.Excellent after sales service and very reliable machines. Anyone looking at any type of power solution and using any type of machinery, these convertors can be setup to suit.We were quoted $260,000 for ETSA to give us a 3 phase connection! so the idea of a good reliable convertor for each situation is an excellent option for us. The Phase Change Converter literally saved our livelihood and would with out a doubt probably be the best piece of equipment we have ever purchased. Q1, How is your machine running - My Machine runs Beautifully , down time in the last 3 years has been next to nothing. Since purchasing this machine about 3 years ago the after sales service and support has exceeded all expectations. It would not have been possible to have this business in its current location a few years ago, as the price of 3 phase power connection would have been to expensive. As most people looking at machines like this do shop around I did find many fancy looking imported (Chinese) machines at a cheaper price but being an Australian made product I was hoping that if I did purchase this product would get good Tech support for install and a reasonable after sales service and warranty support. When I had a warranty issue the support was great and the down time was minimal , about 3 days from first call to part installed , very easy time frame to work around. I get many people inspecting this machine in my work shop as they get surprised how I run the equipment I have where I am and I do not hesitate to recommend this product as when in a semi remote area you rely on helpful support which I receive from this business. My introduction to Phase Change Converters and the excellent Phase-Changer convertor product came not long after I visited an engineering trade exhibition in Sydney three years ago. My hobby is my workshop and I have a variety of power tools and machine tools including a single phase lathe and single phase milling machine. Whilst admiring the many machines at the trade show I came upon a mill and decided to upgrade. I bought it there and then. Even though my home workshop has only a single phase supply and the mill was a three phase machine I thought I'd just get a three phase supply installed. After a couple of quotes I discovered the cost would nearly match that of the machine itself and so I had to consider other options. After a search of the internet I came across Phase Change Converters and decided to purchase one of their models. This has proved to be a great decision. I use the mill three or four days a week and the Phase-Changer has been very reliable. I intend to move house shortly and won't have to worry about a three phase supply at my next abode - I'll just take the Phase-Changer with me. I'm very impressed with the product. The phase converter that i purchased from your company for my milliing machine is fault free and meeting my expectations of the product It is doing everything that i need it for. Great product as i have no issues with it at all! Hope this feedback assists you. 1, Approximately June 2009 I was offered an $8000 connection fee and a minimum usage rate contract for the connection of three phase power to my rural workshop. I went searching for a more cost effective arrangement and found it with the phase changer. 3.3 Morse taper pedestal drill 3.4 200 ton hydraulic horizontal press. I do not operate more than one piece of equipment at a time. 4, The phase changer operates faultlessly at all times. It is one of those tools that is eventually taken for granted because it just does what it is supposed to do without any fuss even when supplied with the variable frequencies that the supply authority seem to get away with. 5, I am very happy with the equipment and recommend it to anyone that comes into my workshop and have similar requirements. I can now take advantage of 3 phase equipment sales have no hesitation in taking the phase changer with me on external tasks and utilising standard power to operate other equipment. 6, In short It is not often that I send out thank you letters to suppliers for their equipment. This is an excellent product that does what it says. There is small torque loss on the lathe when taking cuts over 6mm steel deep using high speed steel tool bits. This is easily rectified by reducing the machine load. There is no noticeable power or torque loss on any other equipment. Productivity is not adversely affected. 7, I or my company is not affiliated with any member of the phase changer company or its sales staff but feel if an individual has little hesitation in complaining about something then the opposite should also be exercised. Phase changer representatives are free to utilise my comments to support this product any time they like. Any person contemplating buying one is free to contact me. Having used one of your phase changers for a couple of years, I am very impressed with its performance. One additional benefit was the fact three phase motors are much cheaper than single phase, so the cost saving on additional tools was significant. As discussed yesterday I am very pleased with the operation of my lighthorse converter, although I dont use it super frequently it is fairly quiet and produces comparable power to when I was running the same machine on 3 phase power. I honestly do not have one bad thing to say about it and have recommended them to anyone who has asked about them. I might just add that I purchased it because of the prohibitive cost of connecting 3 phase to my property was in the vicinity of 6 times the cost of this converter! Phase changer worked perfectly! Never missed a beat.